I enjoyed this documentary, but I'm really glad I gave it a quick preview before trying to share it with the kids. 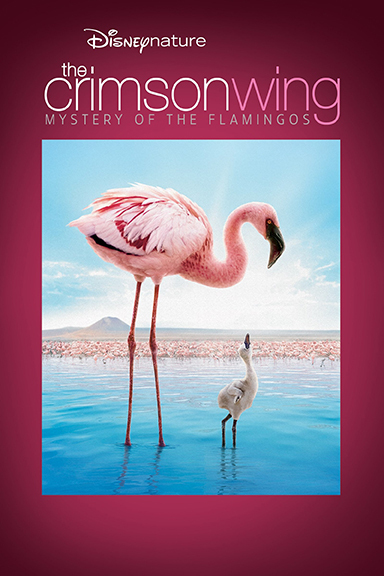 There was a hint on the back cover of the DVD that this might include more than stunning visuals of flamingos. There were plenty of flamingo pictures, but there was also one hyena! So was this going to be a nature film where the good guys get eaten? Yup, I know that happens in the world, but I don't know if my kids have to be exposed to that quite yet. So I gave it a fast forward viewing and found newly and not yet hatched flamingo chicks getting eaten by Matabou storks (30 minutes in), mongeese (53 min), and Hyenas (62 min). Oh, and at about the 40 minute mark we get to watch a struggling, crippled chick how is left behind to die. So I will not be sharing this with my 6-year-old and under crew. 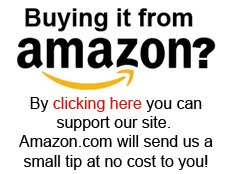 Who would like it? 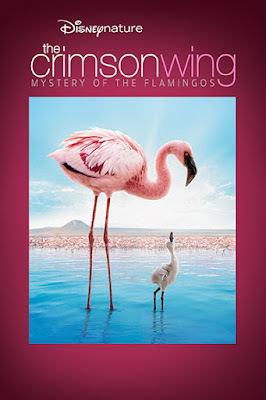 The visuals are indeed stunning – the opening shots of a sea of bobbing flamingos are exotic, strange, otherworldly. But in addition to the shots of "nature, read in tooth and claw" the film will discourage some viewers with its slow pacing. The birds are the stars here, and flamingos, it turns out, do a lot of standing around. So action is minimal, and the camera tends to linger long over each shot. But one man's slow pacing is another's calm close-ups and patient panoramic views. A bird lover will find much to love! "The story of the bird is a promise to us - Nature's affirmation. In winter or in death, in times of desolation. the rain will arrive, the call of the birds will be heard and everything, everything, can begin again"
Nothing all that disturbing. I mean, we weren't expecting anything Christian from Disney, right? So who should see The Crimson Wing? This is an intriguing, visual feast best suited for documentary-loving older children or adults who already love these birds and would love to learn more.